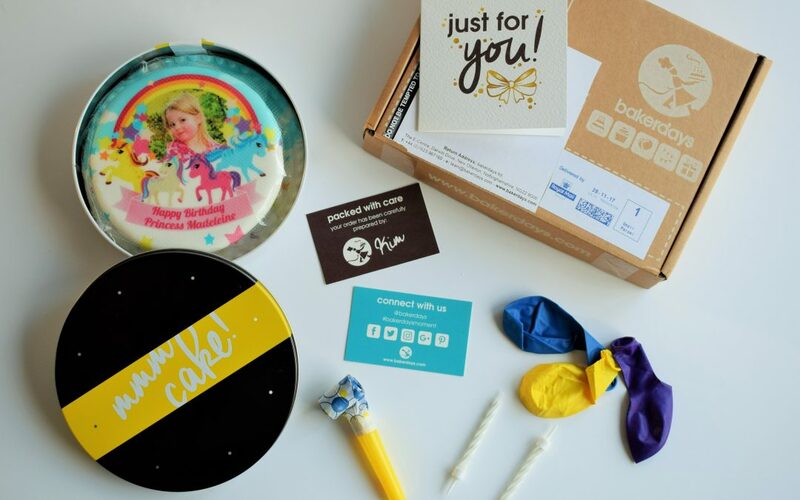 Every year I spend hours scouring Pinterest in search of the perfectly decorated birthday cake and the coolest party invitations for the kids. Last year they had a joint “My Little Pony Farm” party. I designed the invitations myself and had them printed off with Vistaprint. Thomas had a farmyard cake and Madeleine had a My Little Pony cake. Talk about stress. Maybe it wouldn’t be so bad if their birthdays were spread out throughout the year but having them four days apart in December ups the pressure somewhat! 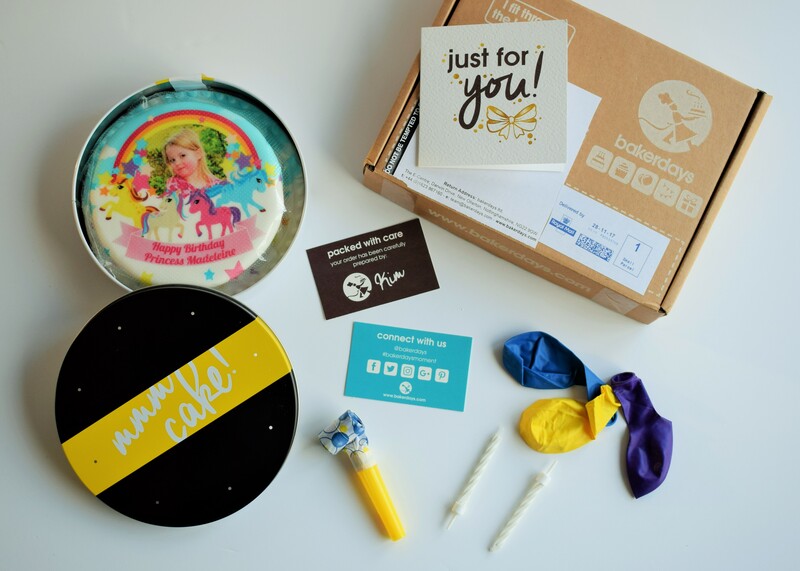 Thankfully, bakerdays and Mini-Epic came to my rescue this year with some rather fabulous letterbox cakes and personalised video invitations. First on the agenda was cake. 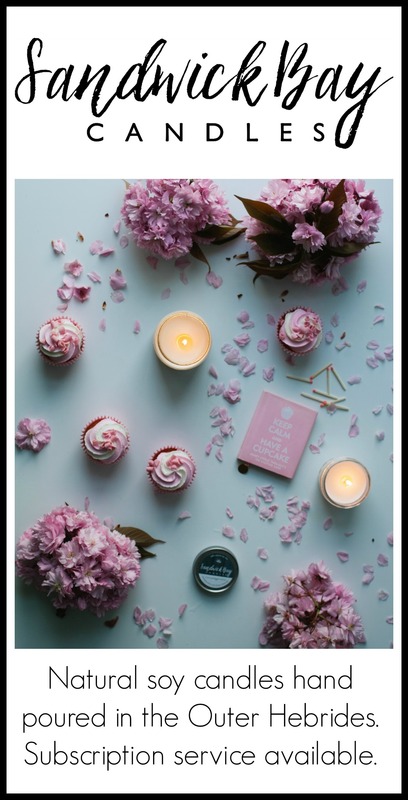 I love baking but I seem to be so short on time lately so when I heard that bakerdays would deliver freshly baked cakes to the door I couldn’t get them ordered quick enough! For Madeleine I chose the Rainbow Pony Cake* in chocolate which was personalised with her photo and the words ‘Happy Birthday Princess Madeleine’. Needless to say it was a huge hit with her friends. One of them in particular was extremely excited to eat Madeleine’s face! 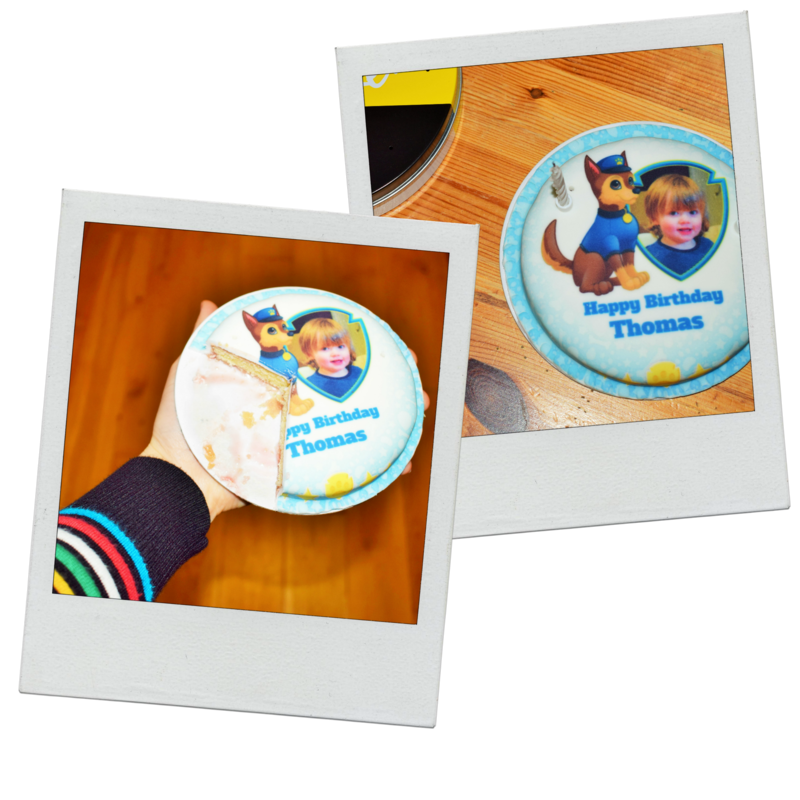 Thomas is obsessed with Paw Patrol so for him it had to be the Blue Dog Photo Cake*. I went through the same ordering process but this time chose the gluten free option and arranged for it to be delivered to the Hilton in Aviemore as we were staying there for a few days over Thomas’s birthday. Again, it was super simple to do. The hardest part is choosing from all the lovely designs! I didn’t get chance to try Madeleine’s chocolate cake but I’m guessing by the speed at which it disappeared that it was nice! 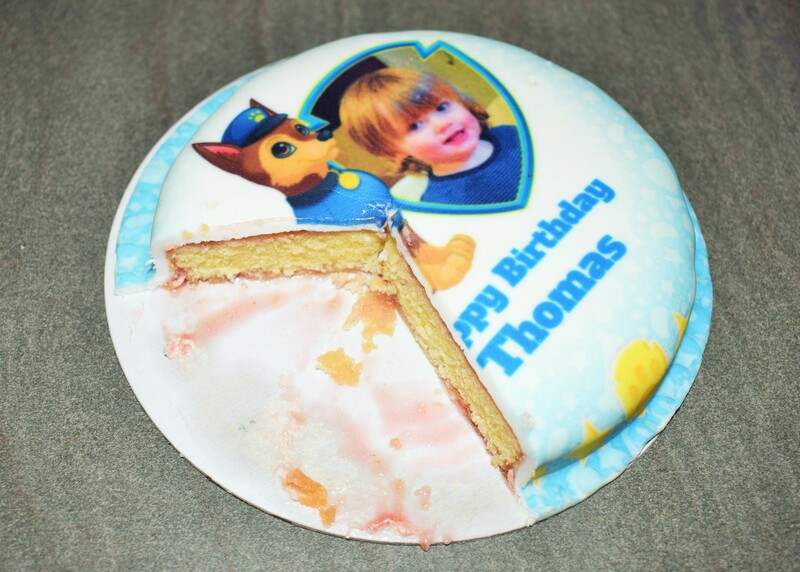 I did, however, eat more than my fair share of Thomas’s gluten free cake and I can confirm it was delicious. And the kids were both very chuffed to have their face on a cake! The individual cakes arrived in a tin alongside some balloons, 2 candles and a party blower which is a really nice touch. I have to say, I’m a fan of beautiful packaging. I think it makes such a difference. Overall, I was really pleased with our letterbox cakes from bakerdays. It’s a great idea especially as a gift for a loved one that you may not get to see on their special day. You can also choose to get a Christmas cake delivered which would be a perfect present for your in-laws or granny. I can’t tell you how excited the kids were to open up their little parcel and discover their very own cake inside! At £14.99 the letterbox cakes originally seemed a little pricey to me but considering they are freshly baked to order and the quality of the packaging I soon changed my mind. Not to mention the fact it takes all the stress out of birthday cakes! No more endless searching on Pinterest to find a cake that will look nothing like the picture when I’ve finished. No late night baking or emergency trips to the supermarket for extra icing. Just order, open and eat! As I’m sure you know, five year olds are a particularly fickle breed so I was very pleased to hear that the video party invitations from Mini-Epic were also a big hit. It really is such a great idea and I love the eco-friendly nature of it, too. You simply choose the video template, upload a photo, add the text and download. It’s so easy! There’s dozens of themes to choose from with everything from video games to baking. You can also email it directly from the website and keep track of the replies, all in one place. It’s simple & effective for the parents and fun for the kids; you can tell the folks at Mini-Epic are parents themselves, can’t you?! How cool is that?! Madeleine still likes to watch it every now and then. And it’s not just for the kids; there’s adult ones, too! So there you have it. Two things – invitations & cakes – that would normally have taken me 10-12 hours of work, were all sorted within 20 minutes of me sitting down with the laptop. Mini-Epic and bakerdays are definitely the way forward, mums!